Home / Corals / ReefRoids from Poly Labs. 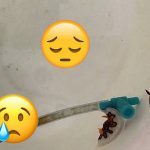 Superfood for filter feeders? 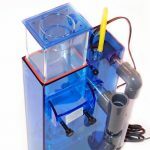 Reef-roids is a new take on the filter feeder foods available on the market. 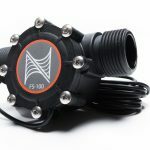 It is specifically formulated to have a particle size in the 150-200 micron range, which the manufacturers, Polyp Labs, suggest is the best size for most filter feeding corals out there. Originally this food was designed to alleviate issues with long term captive care of Goniopora species, but is now marketed as a general food for filter feeders. 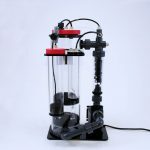 According to the manufacturer, “Reef-roids is a mixture of naturally occurring marine planktons including a specific species of zooplankton that is unique to our product” that readily disperses in tank water- unlike some of the other dried food preparations on the market. In addition, Polyp Labs state that “When using Reef-roids, you will notice excellent polyp extension on all filter feeding corals. Zoanthids, Mushrooms and Ricordia will demonstrate a distinct feeding response”. While I cannot attest to the claims of a unique formulation, my experience with Reef-roids would certainly agree with the latter two statements. I used the food in two ways, initially as a targeted food with several filter feeders and as a dispersed food in the water flow. My mix was quite dilute, a quarter teaspoon in a cup of water and stirred well. The first thing I noticed was that the food did indeed disperse very well, although a few larger particles seemed to congregate on the bottom of the cup. After turning circulation off, I selected a few corals to feed. Using a turkey baster, I drew up the cloudy pink solution and gently added it to the corals. This initiated an almost immediate response on the larger animals. Both sun corals and several scolymia I have in my system literally turned inside out to expose feeding tentacles. 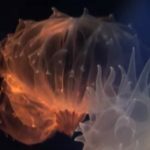 In the attached images you can se e the sun coral before and after feeding. I have had this coral for a month now and it generally is partially open, as shown in the picture. It had been like this for several hours before I target fed the Reef-roids. As the food spread across the corals there was a distinct feeding response that was repeated again a few minutes later with a second dose of food. The right hand side image is the same coral an hour after feeding with the water flow returned. The Scolymia had pretty much the same reaction. A small amount was sprayed onto the disk to entice a feeding response, which was both rapid and impressive. I also tried target feeding plate corals, maxi mini carpet anemones and several chalice and Acanthatrea species. In each case the response was the same. After target feeding I returned the water flow and added the rest of the mixture to the tank water to feed the other animals in the system. While the response was not nearly as impressive, several coral frags did appear to begin to feed. I have only target fed the corals in the system for about 10 days, and maybe it is wishful thinking on my part, but I do think the response to the food is becoming more rapid each time. I cannot vouch for the long term success of corals with this food, but I will certainly be using it on a regular basis in the display and frag systems I maintain. 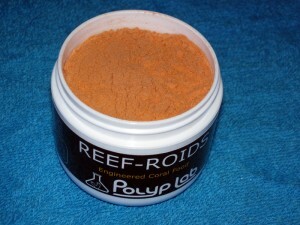 While my opinion is just that, an opinion, I would give Reef-roids by Polyp Labs two very strong thumbs up. So far I am liking this stuff. It’s the first dry coral food that hasn’t caused my NPS coral polyps to close.